you not only receive your order, but you get me too! That is in the sense of having your very own Chalk Paint® Consultant. I am available to answer questions regarding color selection, application, and troubleshooting, etc. I am always only an email or phone call away! 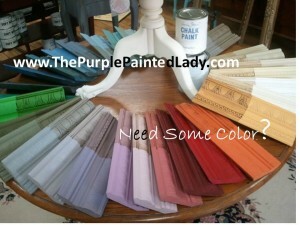 ALL of Annie Sloan’s 30 beautiful colors ARE IN Stock! I am pleased to offer Annie Sloan’s amazing, easy-to-work-with Chalk Paint™ that is taking the country by storm. 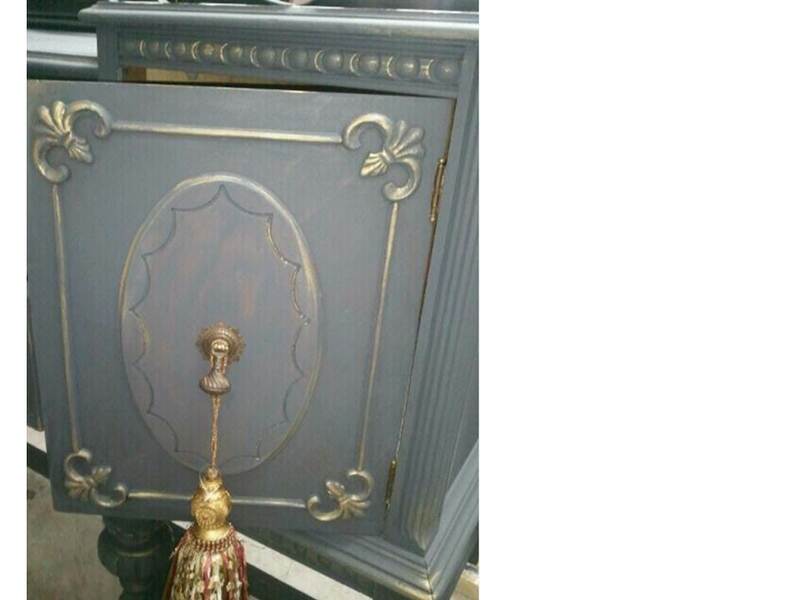 As stated on her website, “Annie Sloan developed her now famous Chalk Paint to answer the need she had for a paint which would have many uses from acting like limewash to looking like old painted furniture and that had a good range of colour that could be extended by the user. This paint is very easy to work with and allows people to be creative …” ! This amazing “girls’ paint” requires no stripping, priming, sanding or prep at all … and boys can use it too! Chalk Paint™ by Annie Sloan is so versatile that you can paint almost any surface, indoors and out, including waxed and varnished furniture, walls and floors, shutters and doors, clay and concrete pots, and iron gates and metal light fixtures. Paint has extremely low VOCs so it is good for the environment and doesn’t smell. 1) It dries in about 15 minutes to one hour. I’m not joking. BUT for rule of thumb- I never do more than THREE (that would be my max) applications of anything to a piece per day. 2) It adheres to just about any surface you can think of. Wood. Plastic. Metal. Brick. I can go on. 3) It requires NO sanding or priming. NO prep work!!!!!! 4) Let me repeat: It requires NO sanding or priming! 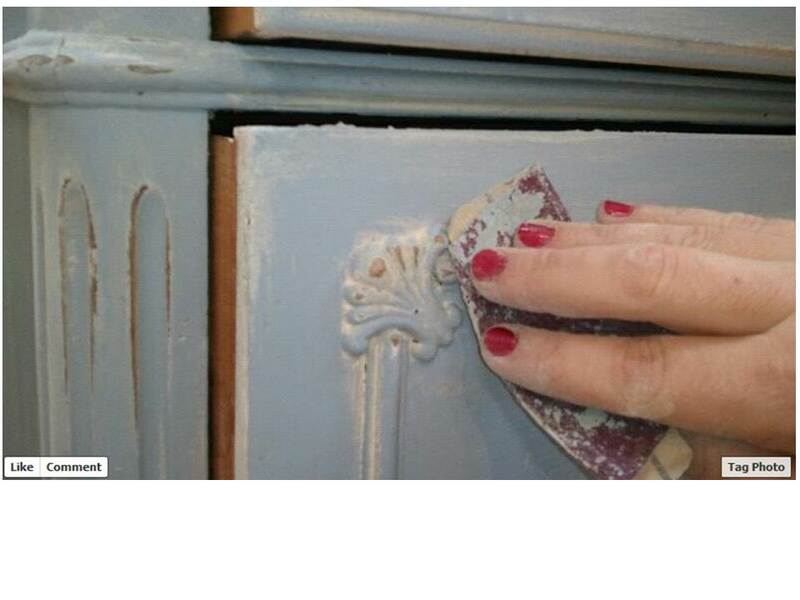 5) It can be distressed immediately- BUT will create a FINE powdery dust which is OK- but that is why Annie Sloan always suggests a light clear wax coat prior – let stand an hour or so. You do not want the wax tacky to the touch. Then- when you distress the piece you will not have any particles. I distress sometimes before I clear wax it- depends on the look I am going for. 6) The paint does not roll or peel like latex, and appears as if the paint has truly worn off over time. 8) The finished piece will have a surface texture that is smooth – UNLIKE any product I have ever used! 9) It can be added to water or various other materials to create washes, glazes, and other faux finishing mediums. 10) It is low VOC paint. No nasty, smelly fumes! 11) You can use it in a sprayer if you wanted! There are a few tips I’ve picked up on, though, since I started using it. So I thought I would share some information here for you. Where do you buy Chalk Paint™ by Annie Sloan in Upstate New York? It cost is $36.95 for one quart, which may be considered higher than the average $18 can of latex from a local big box/hardware store. But when you factor in the time and money you save because you don’t have to sand, purchase primer, or remove stains and varnishes, it’s absolutely worth it!!! Not to mention- the ultimate finish you will get on your piece. The end product produces a smooth satin like feel!!!!!! It also goes a long, long way. 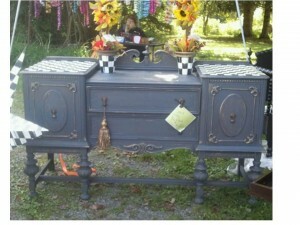 I’ve used one can to paint two large dressers and several smaller pieces. Do you use a special brush to paint with Chalk Paint™? 3. Use the paint and wax at room temperature and make sure the furniture piece you are painting is AT ROOM TEMPERATURE. 4. Make sure the lid is on tightly after using and do not leave the can open for extended periods of time if not using the paint. If the paint thickens too much because of this- you can add a LITTLE water using a teaspoon to control how much you add- and mix it to the consistency it was. Well- that is an interesting question- because there are 30 base colors, but when you account for mixing and playing with variations of hues- you can think of it as 1,000’s. What kind of finish does the Chalk Paint™ have? 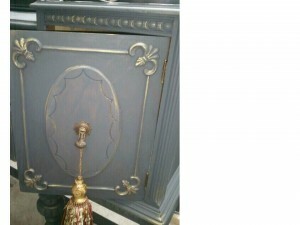 Without a protective coat, the paint has a very matte, chalky finish- but smooth to touch. The only time I haven’t added a protective finish has been on a couple of items that would receive very little wear and tear. I wanted to leave them with a very shabby chic look and let them distress even more naturally. What kind of protective finish do you use? I use Annie Sloan clear wax. It doesn’t change the paint color but intensifies it- deepens the hue. I also use Annie Sloan dark wax for a more antiqued look- and I approach this application with a plan. Prior to applying the dark wax- a clear wax coat is done. I usually do one – maybe two coats of wax, but for table tops where more protection or water resistance is definitely needed- three coats. AND ALL COATS ARE APPLIED lightly- wiping the excess with a rag. To create more luster or shine, I use a soft cloth to buff the wax after it’s dried for about an hour. Do you use a special brush for applying the wax? Well, that depends. The Purple Painted Lady strongly recommends using a wax brush. Reference our on-line store to see one. If you do not have one, an OLD paint brush can be used. (don’t use a new one since the old ones that have worn bristles are best and once you apply wax to the bristles- you will not be using it again for paint) If you plan on doing more than one Chalk Paint™ by Annie Sloan project- or a LARGE piece – you may want to consider a wax brush. They are not inexpensive- but make the wax application so much easier. They retail at $34.95 and will last forever! (as long as you take care of it) If you plan on doing a lot of furniture- you should have one for clear wax and one for dark. BUT again- if you have a tight budget – a work paint brush can also be used. Do you do anything special to apply the wax? Apply it lightly. Often in photos you see brushes with a heavy amount, but that is only because visually they needed a lot of wax for it to show up in the photo. Apply in light coats BUT push the wax into the paint. (does that make sense?) Work in small areas and lightly wipe off extra wax with a clean soft rag or towel. Many stockist use the analogy of applying hair conditioner. You apply it to your hair and then do what? Rinse it off. That is because your hair will absorb what it needs. 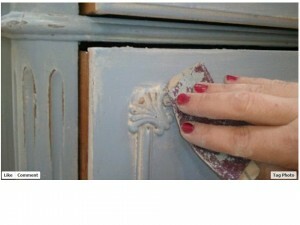 Chalk Paint™ by Annie Sloan will do the same thing in regards to the wax! Let the wax dry till it is touchable and not tacky- usually about an hour. Then you can buff it with a clean – lint free rag. The more you buff- the smoother the finish will feel to the touch and shinier the effect. If you are applying multiple coats of wax…lightly rub out each coat- but only buff the last coat if you are going for a shinier finish. I hope that this helps all of you. 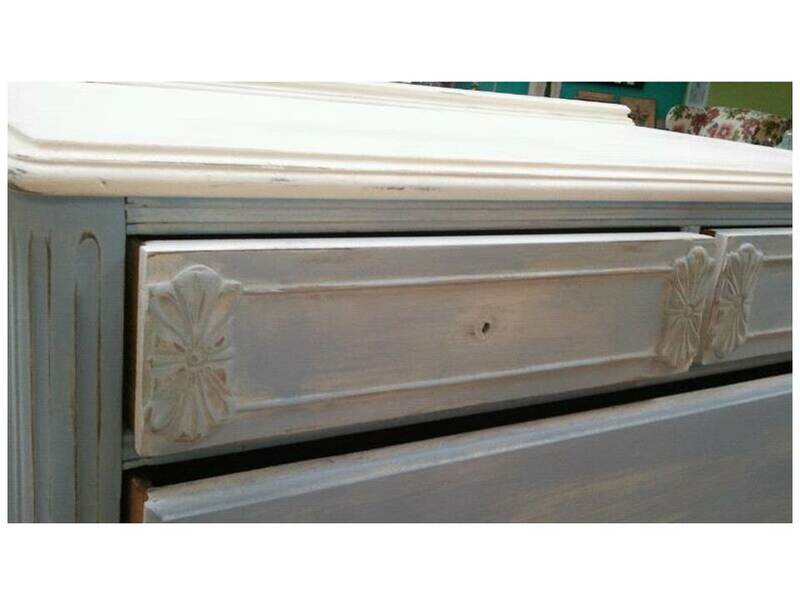 Again- remember Chalk Paint™ by Annie Sloan is not to replace GLOSSY latex paint. Call or email me – Trish at The Purple Painted Lady if you have any questions! All my contact information is on my HOME page and my Contact Me page. I am here to help you! 1. Choose a base coat. Often Old White or Cream. Use a two-inch brush. Apply lightly. Coat the whole piece, and don’t worry about total coverage. It’s okay if a bit of wood still shows since this is the first coat. Let dry for an hour or so. 2. Apply one thick coat of another color. A few favorites are Louis Blue, French Linen or Paris Gray. Wait an hour or so and then……apply a second coat. The wood should be totally covered. 3. 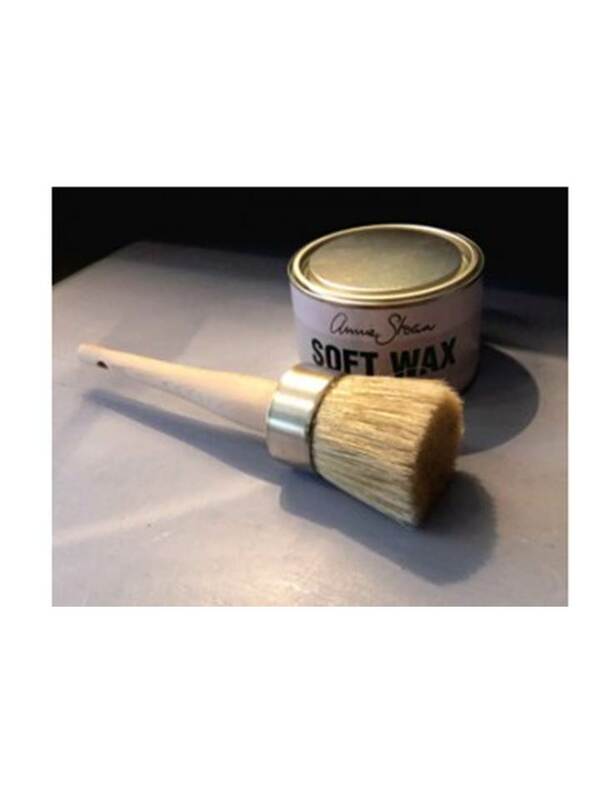 Brush on a coat of Annie Sloan Clear Wax using the Ultimate Wax Brush. The piece will get darker and smoother, taking on a new look. Your piece should feel dry very quickly if applying correctly – like in minutes after waxing. So once it is smooth to the touch. Then using sandpaper or Grade 3 (000) steel wool (although Annie prefers no wool), rub and distress it until it has an aged, worn look. Concentrate on corners, edges and legs, especially working over keyholes, finials, handles and carvings. 4. Brush on Annie Sloan Dark Wax. It is recommended to have a second wax brush as so to not contaminate the brush you always use for Clear wax. 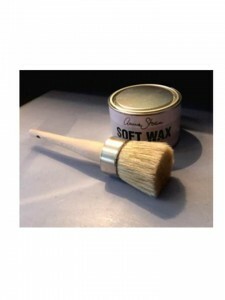 This wax gives a smooth, satin finish and highlights details. Be careful not to use too much Dark Wax because it can look sloppy….then use Grade 1 steel wool as the last step, to take off excess wax until you get the look you want. 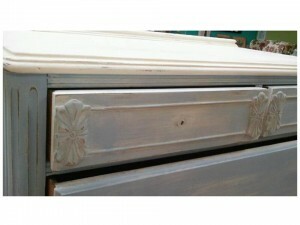 The end result will be a piece that looks old, special and one-of-a-kind, as if it was found at a Paris flea market.